Chicken Feet: Why you need them in your diet and how to prepare them! Chicken feet. The feets of the chicken. Boys and girls, that’s what we’re talking about today. Now, don’t go gettin’ all grossed out. Y’all are familiar with our ideals for our farm. Nothing gets wasted. And why on Earth Americans wasted these wonderful morsels is beyond me. We’ll eat fast food but we won’t simmer chicken feet for stock? Fu-get-about-it. Because your body needs lots of vitamins, trace minerals, collagen, and calcium. That’s why. Bone broth has been known for centuries to aid in joint health, immunity, gut health, and more. Nutrients are pulled from the bones and cartilage, slowly swirling into a liquid gold – rich in vitamins, minerals, and feel good-ness. Bone marrow carries oxygen to our to our cells. Collagen builds the cells in our brains and bones. It rebuilds damaged cells in our intestines. It is, truly, natural’s super-supplement. 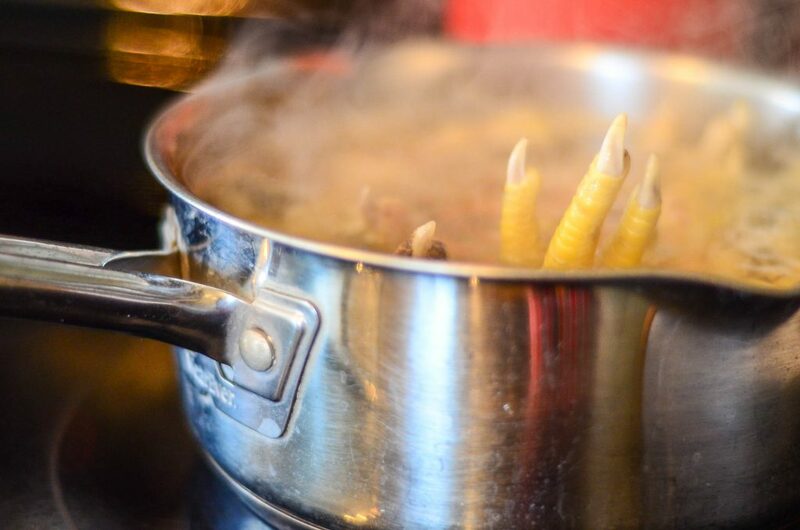 Adding chicken feet to that pot ‘o stock ups the anty. Chicken foot stock is like stock on steroids. Chicken feet are comprised of entirely bones, tendons, and cartilage. Gross, right? I mean, sure, yes – gross. But what our bodies can pull from those feet nutritionally is pure magic. Track minerals and calcium dance like sugar plums in our bowls. If you want to heal yourself from the outside in, start with chicken foot bone broth. We peel chicken feet for a couple of reasons. First, the chickens (naturally) get poo on their feet. We don’t want poo in our stock. And thus, we peel. Second, the skin can tend to give the stock a bit of an ‘off’ taste. Being a minimalist, I tried to skip this step a few times until I realized that it really does create a funky taste in the stock if we leave too much of the skin on. And thus, we peel some more. Because we raise our own meat chickens here on the farm, twice per year, we’re left with fifty or so chicken feet. At butchering, I simply throw them into a plastic bag and freeze them. Each week, I pull a small handful of feet from the bag and prepare them to be utilized in my weekly stock pot. Preparation is easy, albeight a bit grizzly. Here’s how I peel my chicken feet. (Also, just to make sure you didn’t miss it: I boiled this process down and put it on a one-page recipe card for readers of this post. Get that Recipe Card here. 2. Put the pot on the stove and bring to a low simmer. Simmer the feet for 10 minutes. 3. 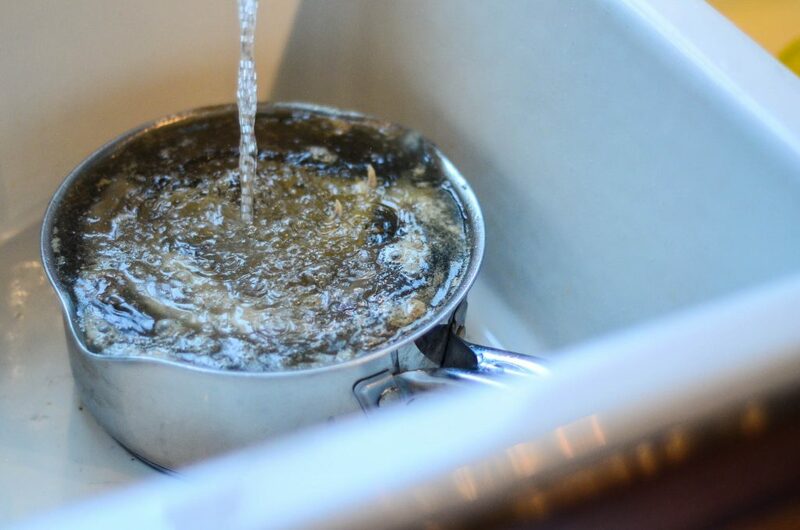 After simmering, quickly move the pot over to your kitchen sink and run cold water onto the feet. Keep running the water for a few minutes, allowing the feet to ‘blanch’ in a way. 4. Drain the water and move the pot of feet over to your counter. Using your fingers (the best tools ever created!) begin to peel away the skin. It’s a bit slippery – but that’s okay. Just dig in there and go for it. I find that a twist and pull method seems to work best on the toes. Some people leave the toes on. Some clip them off. Do what you wish. Personally, I’m a toes on kinda gal. Mostly because I’m lazy. I’m also not a perfectionist when it comes to this task. I don’t mind a few bits here and there. These feet can be simmered alone with a tablespoon of vinegar, a chopped onion, a few stocks of celery, and a few carrot sticks to make a beautiful chicken foot stock. I, personally, like to add 3 or 4 feet into my normal chicken stock. This enables to get all those rich nutrients from the feet and since I’m also utilizing a chicken carcass, spread out that goodness throughout the whole year. When I run out of chicken feet, it’s a sad day on the farm. Girlfriends gotta protect herself from such heartache. And thus, ration we must. I’m sorry for saying ‘and thus’ so many times in this post. It just seems so fitting. And thus, I say it. See what I mean? Wait, what were we talking about? Chicken feet? Ah, yes. 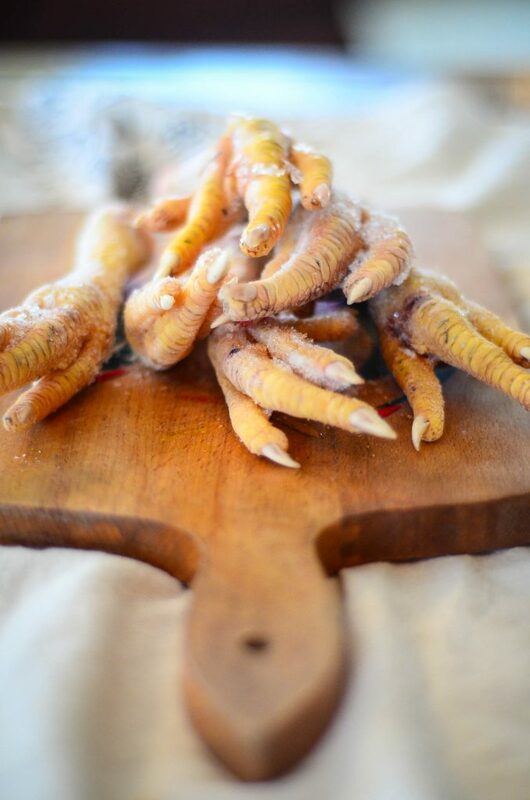 Chicken feet are widely available – from your grocery store, to a butcher, to your local chicken farmer. Finding a source should be fairly easy. I recommend you keep some in your freezer at all time! When sickness creeps in, stick a few extra into your stock pot or into your chicken soup. Your body will love you for it. I don’t want to hear that you think they’re gross. They’re a rich form of nutrients that is widely underutilized and wasted. And, if you remember this post (Eww! You eat WHAT?!) you’ll know how I feel about it all anyway. Wishing you many happy days filled with chicken feet. We peel our chicken feet at the same time we process our birds. The key is to use shackles when scalding so that you can dunk the feet completely under water when you scald the rest of the chicken. After 45-50 seconds at 150 degrees, I grasp firmly at the knee joint and make a swift motion towards the feet and all the outer skin should just slip right off. Sometimes the outer layer of toenail will come off too, but if it doesn’t just grasp the nail and bend backwards towards the top of the foot and it’ll pop right off. Also, if you ever end up with too many feet that won’t get used for stock before next processing season comes around, dry them in the dehydrator and they make great all-natural dog treats. Since the bones aren’t cooked, they are totally safe for dogs. glad you posted this. I use the same scalding water from processing and clean them right away. This scalding time is too long IMO and the feet have started to cook in the contaminated water. We lived in China for several years. They eat pretty much every part of any animal (except chicken breast. They feed those to the dog. “No flavor”). They sold chicken feet and neck in little packages at the grocery checkout line, like we would have candy bar in the US. True story. Man, I miss that place. Goodness yes! I got to go to Hong Kong when I was eleven, and eat chicken feet. Quite the experience, but it was tasty! We butchered chickens with a neighbor. She got the fat from the chickens and cooked it down and put it in Mason jars for cooking and baking. I got the feet for stock and it was the most delicious ever! Why the heck not? I’m sure the stock you pay $4 for at the store has chicken feet in it. I think of it every time I crack open an almost free Mason jar of pressure canned stock from my pantry! How long do you process your broth. Did you ever get an answer on this? I’m getting the necks, gizzards, heart, livers and feet of some pastured chickens fairly soon. 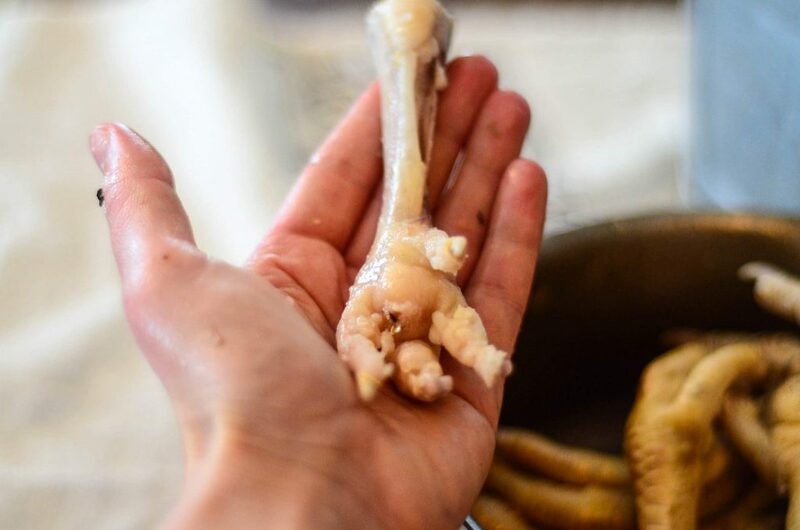 I’m an old hand at bone broth… but I’ve never tried using chicken feet. Adding to the list of things to try in 2015! How was your chicken feet stock? Ok, I didn’t know this. I love making stock and I don’t raise chickens. Not sure where I’d get these but I’m gonna hang on to the idea. You’re very wise in you use of the whole thing. Enjoy your blog even though I’m a city dweller. You go girl! If your regular supermarket doesn’t carry chicken feet, try an ethnic market – I was in two Asian grocery stores and a Mexican Grocery this last week and they all had chicken feet – and the price was good. Go to just about any oriental grocery store and they have chicken feet. I have to admit that the toenails really creep me out, but I use the feet anyway of course! Thanks for the tips on peeling them! I wasn’t super pleased with the method I had tried before. 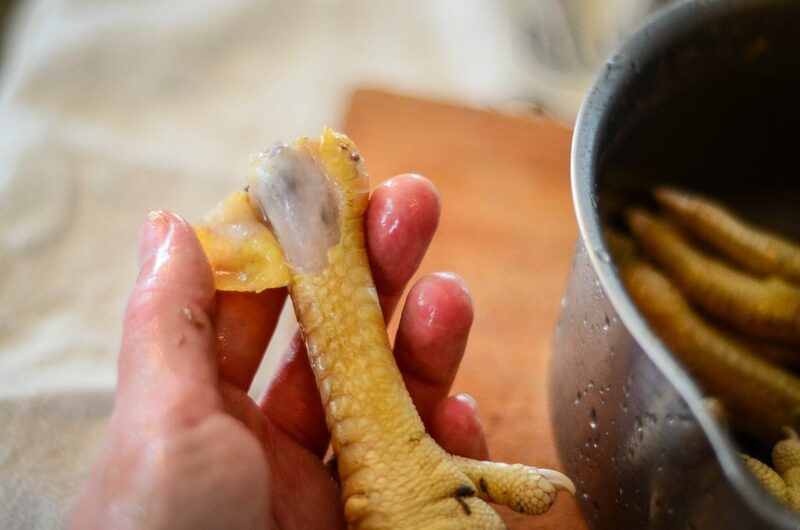 The best chicken stock I ever made was with the feet and gizzards included. It had so much more flavour than my usual stock which just uses the leftover carcass. Trouble is I left the feet in a pot overnight to dispose of in the morning. Then woke up dopey, removed the lid wondering what was in the pot on the bench…… It gave me such a fright!! Ahh! I wish I had read this before I made turkey stock with feet! I used the bird and its feet and organs, so hopefully the taste isn’t thrown off by the skin. I have 13 quarts of beautiful stock on my shelf now. The feet I get from the butcher are perfectly clean, so I have never peeled them. I don’t notice any “off” taste as you’ve described. I’m not a fan of looking at the creepy toenails, so I am glad this works out 🙂 They do make an incredibly rich broth. Love it! Sipping bone broth now… ‘If a few toes are stickin out that’s fine’ hahahaha! Love it. As always! Why do you take the skin off? Just wondering. I already make stock with chicken feet but leave the skin on. We get them frozen and they’re well scrubbed. Taking the skin off just seems like a lot of work that I’ll never do. Other cultures fry them and eat them, sans toenails. I was raised fighting my brother for the fried chicken feet and the fried heart. Mmmmm good! No way, no how. I got ill just looking at the pictures. i need to know about why you remove the skin too! Is it just for better flavor? 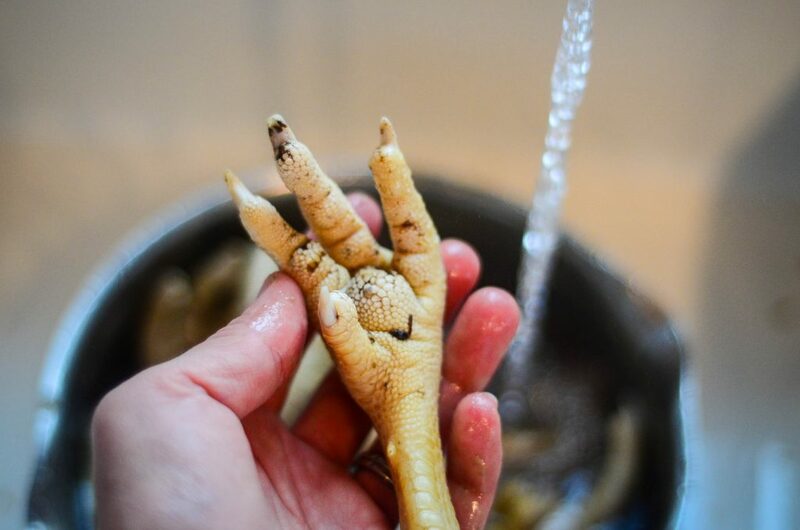 I get chicken feet from a local farmer and always throw a few into my stockpot but have never peeled them, or messed with the toenails either. I wouldn’t even know how to get the toenails off. They are well scrubbed, simmered for 20 plus hours so no poo bacteria could survive, and strain with cheesecloth in case there is any grit at the bottom of the pot. Please convince me! offers pastured chickens or feet? Thanks so much! I love reading your blog…it’s such sweetness to this city-stuck girl. Where are you located? We have feet in Florida…. Loooking for 25 Lbs/ month.. How much? Kevin My dogs love them after I cook them..
LOVE the chicken feet! I used to be grossed out by them but started using them because of the benefits. After a couple of times using them, they stopped bothering me. My sister has a homestead in VT and the last time I visited, she sent me home with a bag of about 70 or so feet. I was so excited that you would have thought I just got the best Christmas present! I second Katie’s comment on the feet. I am a city dweller and buy my feet from Wholefoods. I had never heard of taking the skin off and have been making stock every week for the last 2 years to repair my leaky gut. The feet at Wholefoods are scrubbed as well and are cleaner than the ones in your photo. I figure as long as I rinse and rub off any grim with my hands and paper towel the feet afterwards, before putting them in my crock for 24 hours, I am good. I haven’t had any yucky tasting stock and I haven’t gotten sick from any bacteria. I figure all the poop and grim is gone from the scrubbing at Wholefoods and my rinsing and rubbing the feet. Yes, they were gross to cook at first and I would get extremely nauseated when I first started cooking them. I would scream if the toe nails scrapped my hands a certain way, but I know it is for my benefit. No more grossing out here. Thanks for the info and hopefully for answering Katie’s question. They have probably been peeled already. Ditto! The original post about removing the ‘outer’ skin was when you dress the chicken and dunk it in hot water to pluck the feathers!!! The ones you buy are ready to cook. Awesome post! It puts me in mind of the time I got in the truck with my soon-to-be Russian mother-in-law around hog butchering time. I happened to glance in the bucket sitting on the floorboard and had a pig head staring back at me. Good times….. Seriously, she used it ALL. Some of the parts modern culture throws away are the most nutritive. And you wanna talk gross? Visit a commercial meat processing plant. Almost everybody thinks that’s just fine. If they only knew. Keep at it Shaye! You inspire me! I get our chicken from a local farmer once a year and this past year I asked for the feet as well. I must admit that adding them to my stock seemed gross, but I’m hoping that the more I do it the easier itwill it will become! My husband and I love chicken feet. Stock comes out so yummy and in the summer when there is zucchini, I love to toss in a few baby zuk’s with the blossom still attached a few minutes before turning off the heat…delicious! I also sometimes make braised “Phoenix Claws” which is an Asian inspired recipe. We love to make and can chicken foot stock! Best stuff out there! Chicken feet have always grossed me out and I personally never liked the taste of them on their own. However, if you keep chickens and butcher your own then throwing them out is a waste. They make an amazing broth! Yes, what Austin said. We just butchered 43 chickens the other day and I saved all the feet. I just dip them in hot water on the stove for about 10 seconds, and dip in cold water so you can handle them and the outer yellow skin slips right off. I also use my rose pruners to snip the nails off. Then they are ready and clean for either making Chinese or Korean chicken feet, or for broth. Most good Oriental grocery stores carry it as a regular item. Also many other unique items, well worth getting to know your local store. How long do you cook them? 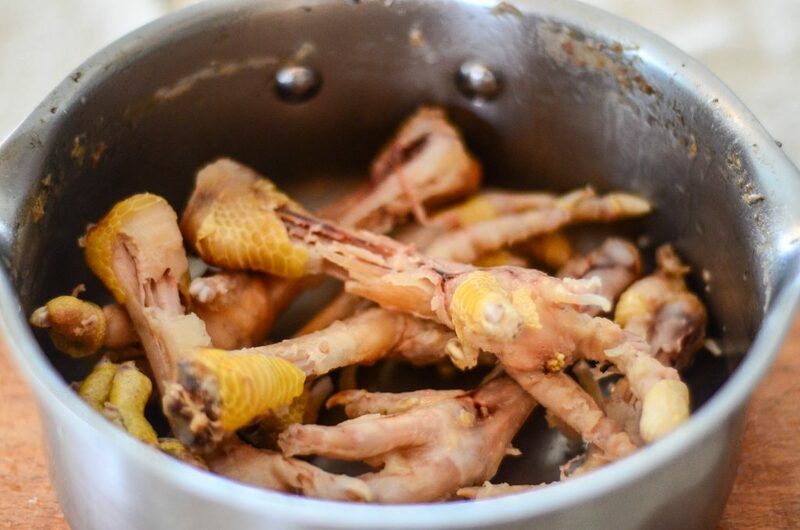 We are doing the GAPS diet, and one of my fellow GAPS-ers said when they added broth from chicken feet, it really added a new dimension to their healing. I just got 80 pounds of organic feet from Azure Standard. That is one ugly sight in my freezer. *Shiver* I’ve had to tell my husband to stay out of the freezer or he will never eat my soup again. I cooked some feet today and only cooked them 2 hours, just like I was boiling a chicken to make meat stock. Do you ever recook the same feet for another batch of broth? I do that when I make bone broth. What do you do with them afterward? I know people who eat the feet after they are done making broth. I. Just. Can’t. I give them to my dog 🙂 I usually simmer them for 24 hours while making stock. Well, I just got on this today, (3-11-2018,) a little late, but I simply asked Google how many bones do Chicken feet have, and this is one site I looked into. I find it amusing with all the comments, as I find so many people who do the “Yuck! !”, “Gross”, episode. I am country, and we had chicken feet to eat when I grew up. I am not familiar with the Broth, Bone Broth, nor Stock, but I did make a large pot of Chicken Stew last night, where I used a breast, and lots of vegies, Onion, Carrots, Potatoes, (both red and white,) Parsnips, Turnips, Rutabaga, Celery, Chicken feet, (from the store,) and I even chopped up a Lamb Chop I had, and added it. I put in some Johnsone’s, Garlic Salt, Lemon Pepper, Salt, Pepper, and some Pork & Steak seasonings. I cooked it most of the night, some on low. It tastes great, and I actually counted fifteen bones. April, out of curiosity…how much is 80lbs of feet? Is it enough to fill a regular sized black garbage bag? Reason I ask is because I recently ordered for the first time ever, 20 lbs of feet from a local farmer and I am unsure how many I may be getting (thinking from a “have to peel them aspect”). Thanks! Angi, I did it! For the first time ever in my 30+ years of chicken keeping, I used the feet. Thanks for the awesome photos and instructions. “Thus” I was able to be successful. Just goes to show you’re never done learning on the farm! 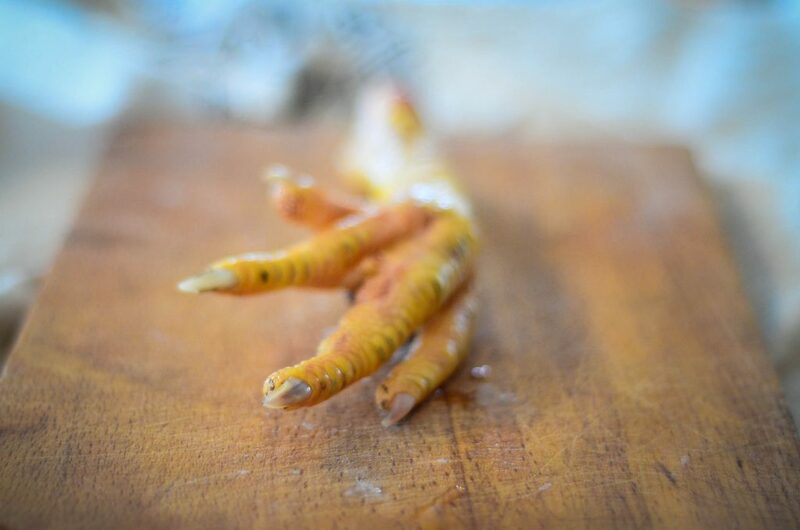 Depending on where your chicken feet came from, the skin may have already been removed. UNDER toenail after the tough, outer (dirty!) toenail is removed. I have just discovered the benefits of chicken feet and thus….there you see, I do it too…purchased some from my local chicken butcher. I am an apartment dweller so this is my best option. I purchased them on Friday and cooked the first batch yesterday, (Saturday), actually that stock is still happily bubbling away. I went to start a second batch today (Sunday), a dog friendly version without the onion ( I figure if its good for us, it’s just as good for them) and discovered that some of the remaining feet have grey spots on them. Is this a sign of disease? I am reluctant to go any further without some information on this. I have googled madly but as yet , without result. Can you give me any information regarding this please? We just made an appointment with our butcher for 30 chickens. She said they are not allowed to give us back the feet and are required to throw them away by state law. The only thing I get is the neck, no organs either. Chicken heart has always been my favorite part of the animal too. Makes me think about butchering my own. That’s crazy. I live near Boston and our butcher gives us back the whole chicken. Yes, I have him do the killing. I just can’t. But he gives it back with head and feet still attached. I’d make a bet the butcher is using your feet and organs for his own pleasure. I am with Shaye on this, (even if I am late to get here,) and say it is ridiculous. I would have to ask the butcher to show me the law. When I take the meats to a butcher, such as deer, I want even the carcass back, as it was what I used to give my Chickens and dogs to eat. I don’t think there are any states which have laws against returning the stuff from animals. They belong to the customer. 1/2 kg feet, how long in a slow cooker ? Do you eat the whole foot, e.g. cook for a long time to soften the bones, then eat all and save/drink stock ? Is it better to keep stock for a day to turn to gel, for better collagen ? I was just at Walmart Supercenter and saw a lady purchasing a package of chicken Paws at the check out .. I about grossed out.. I’ll never be able to eat chicken again.. I Had to read online what she was gonna do with them and now I know. To each his own. I read your recipe for beef bone broth. Is chicken bone broth made the same way? Should I ask for “soup bones” along with the feet? We have recently begun buying things from a local farmer and obtained a pastured chicken last week and bought a bag of feet as I read they had tremendous gelatinous broth abilities. I’ve been making beef broth from grass-fed cows and will continue to but I’m not crazy about the taste. So last night I made a whole chicken in my instant pot with vegetables and after we ate that chicken for dinner I picked off all the meat and tossed the carcass back into the pot. Then came the real fun lol. I wish I could post a video here of my husband playing with the feet acting like a dinosaur. It was hysterical. I had read you should blanch them in boiling water and then in ice water to get the skin off easier because it makes the broth funky tasting and then chop off the talons. (It was not easy to peel off in the least) I was gagging and laughing the whole time. Scariest and most disgusting thing I’ve ever done. The yellow skin was so difficult to get off. It looked to me like the skin was really thick like leather and it seems like it might be easier to extract the nutrients with that skin off. So after straining the broth and chilling it overnight and scraping off the fat we had the thickest most gelatinous solid broth I have ever seen. It was truly amazing. I wish I could show you. Liquid gold. So I heated some up with a bit of the leftover chicken today, it is truly the most delicious chicken broth I have ever tasted in my life! So as disgusting as it all was I appreciated the encouragement in the comments above that you get used to it. I’m never going back, it’s chicken feet all the way for us lol! Now I’m just sitting back and waiting for the magic to happen in my body, haha. But those talons….UGH. I’m still shuddering thinking about it. I don’t think I can bring myself to cook those in the broth. Made me think of a large dogs toenails! Thanks for this. I make broth for our dogs all the time and I’m yet to find a broth recipe which i like, so perhaps i’ll try CF. The feet we have in butchers here in Australia, they’ve taken the skin off already and they look nothing like this. I’m interested as to how THEY get them ready for the consumer. I was uncertain if they left the skin on or off, then one day while getting some out of the freezer for the dogs, there was a couple which had the skin still attached, but kinda hanging there, so I gently pulled it off. A very thin, yellow layer it was, and attached to it was one of the outer part of the claw. The outer part of the claw that i pulled away was hard and what was left behind, attached to the foot, was a much softer inner claw. I was surprised to see how much skin you actually took off, when compared to these ones. Our dogs have all been eating a raw diet since they came to us at 4 weeks. I weaned a little onto raw last year and the boy that we kept is just a super dog! He’s now 15 mths, totally natural rearing, with the exception of one puppy vaccine shot at 10 weeks old and one small worming tablet at the same time. Since then, its been all natural prevention and treating. I run a Facebook group which is growing every day. Anyway, great post! Be interesting to com ape to what others do. No toes?!?! So much goodness gets thrown away?! It’s amazing how many people don’t proofread these days. I bought chicken feet at the grocery store..are they already cleaned? 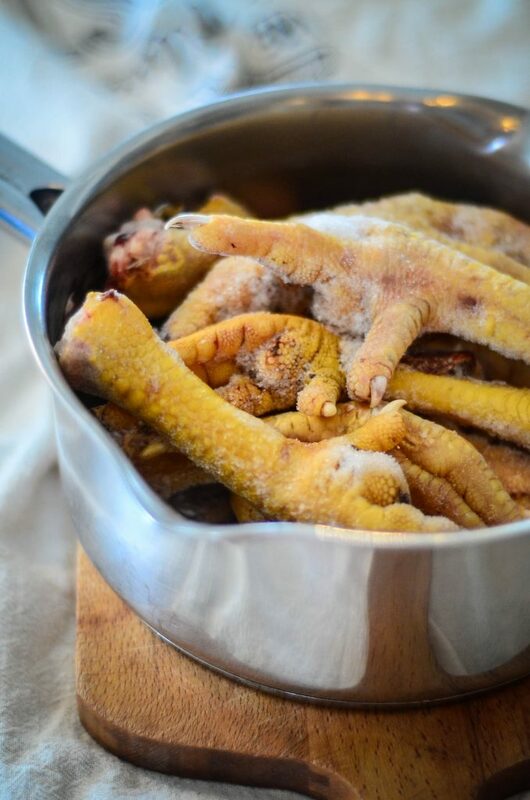 Can you purchase pre-skinned chicken feet? Honestly the skinning and the toenails is my only hesitation. The ones you buy in a store have been thoroughly cleaned and the tough outer layer of skin has already been removed. It healed my cracked heels!! I added pig’s feet to my chicken feet soup and i was suprised to see my heels looking normal. I havent even been applying any cream to my heels in months. So feet healed your feet! LOL! That actually makes sense. Whatever is in pig feet and chicken is probably the same nutrients as in your feet. Personally, I’ve noticed my skin is tighter and more plump when I eat chicken feet soup. They are magic. I grew up in Eastern Europe, where the whole chicken is used for chicken soup, including the organs and feet. The first parts I always picked out for my first soup bowl when the soup was ready were the heart, feet, and head (to eat the delicious brain inside). To this day, I LOVE chicken feet. Now that I live in the US and can buy them by the pound (in my home country you only got the two that came with the whole chicken), I indulge my chicken feet love by using lots and lots of them when I make chicken soup. I can–and do :)– eat 5-6 feet at a time with my bowl of soup. I love the taste of that delicious cartilage!! So, for anyone who is “afraid” of trying them, don’t be, they’re delicious! My mom is taking the skin off by charring the feet on open flame (you just need a gas stove, no grill or outside fire). Surely it takes longer than boiling, as you have to do it one by one, but it’s bullet proof. No meat/cartilage gets wasted and no skin is left on the feet. It also take care of the slippery part. Plus, the feet get a distinct flavor from charring, that can’t be brought in by ant spices. Bahaha! I thoroughly enjoyed being edumacated right there 🙂 Shaye is it? Thank you very much. Say, do you peeps ever need a happy labourer at the Homestead? Thought I might weigh in on my first use of an instant pot to get the yellow skin off my feet. IT WORKED GREAT! I put the feet on the steamer rack added the cup of water and used the poultry function on my Corsori brand instant pot. Set timer down to 5 minutes and used natural release this time. They peeled grandly, even the outer covering of the toenail came right off. My feet are from our own butchering and I had scrubbed them a bit before freezing them in gallon bags in a quantity that would fit in my instant pot. I put them frozen into the IP. Now that they are cleaned, I used a few in a broth batch and am refreezing the others on a big sheet so they will be individual in the freezer bag and I can grab a handful whenever I want .